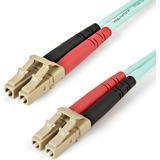 The N821-05M-MG-T 10 Gb Duplex Multimode 50/125 OM4 LSZH Fiber Patch Cable is OM4-rated for use with 10 Gb Ethernet applications up to 400 meters (at 850 nm). Suited for LANs, SANs and high-speed parallel interconnects for head-ends, central offices and data centers, this low-cost cable provides four times more bandwidth than conventional 62.5 µm multimode fiber and performance rivaling that of singlemode cable. Push/pull tab connectors are easily accessible in high-density data center applications and make the cable easy to install and remove with one hand. 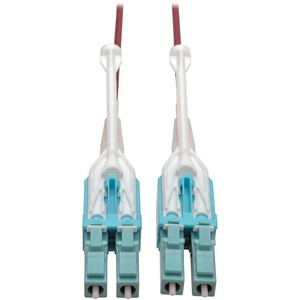 Dual male LC connectors are widely compatible and thoroughly tested to meet stringent insertion loss standards. Premium-grade ceramic ferrules are designed specifically to handle applications of 10 Gb or higher. Colored magenta for immediate identification as an OM4 cable, the laser-optimized multimode fiber (LOMMF) N821-05M-MG-T is backward compatible with existing 50/125 fiber and commonly used with vertical-cavity surface-emitting laser (VCSEL) and LED laser light sources. The low-smoke zero-halogen (LSZH) jacket limits the amount of toxic smoke emitted in case of combustion, making this cable perfect for poorly ventilated areas. The slim, space-saving uniboot design is easy to manage through ceilings, walls and ducts. The sturdy plastic housing is built to last a long time.